The Glengarry News, December 8th, 1960,pg. 1, col. 5,6,7,8, & pg. 7, col. 2,3,4, & 5. Now that Vancouver, Edmonton and Ottawa have returned to normal after the Grey Cup hangovers,let us delve into some History and Geography. My first early Spring fishing trip was to Kenyon Dam with Albert Faubert,the Kennedy and Boudreau boys. The older and stronger pried two planks off the dam top and with this extra flow of water, for a while, I was told the fish would come up stream from Fraser Rapids. The name Fraser baffled me. I knew the O'Connors, O'Neils and McDonalds (Grocer), Second of Kenyon, but who were the Frasers? I learned that the Grocer McDonald family lived on the old Rory Fraser farm and that this Fraser family were descendants of that great Scottish explorer, Simon Fraser, who led the first expedition down the Fraser River in British Columbia. In your youth, nothing is impossible, so I hoped to some day travel from Fraser Rapids, Second of Kenyon, to the Fraser Canyon, B.C. Yesterday I accomplished this desire and the date couldn't have been more appropriate - St. Andrew's Day. 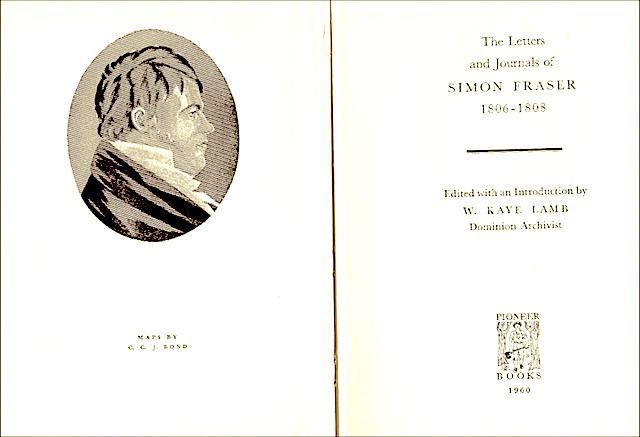 First in capsule form, we shall relate some of the history of Simon Fraser, with acknowledgement to writer W. Kaye Lamb. Simon Fraser, Sr., and his wife Isabella Grant, moved from their Scotland home to what is today Vermont, U.S., where Simon Jr. was born in 1776. Within three years, Simon Sr. died and later his widow and eldest son, William, moved the family to Coteau du Lac. From here the Fraser boys acquired land grants near St. Andrews; however, Simon, due to his youth, was taken to Montreal by his uncle Judge Fraser, where he attended school. It is our Scottish tradition that a young man either pursues an education or he leaves school and bids for a career in farming, mining or the various fields of business and industry. Simon Fraser was no exception and he belonged to the latter class. It appears that after two years in school he called it a day and joined his mother's two brothers, Peter and Donald Grant, with the North-West fur traders. Those two years in school enabled Simon Fraser to start as a clerk and about nine years later, at the age of 25, he was made a member of the company. It appears the Hudson Bay Co. competition was tough and getting supplies to the North-West was tougher still, so the Company in 1805 instructed Simon Fraser to cross the Rockies and explore what was then thought to be the Columbia River and a route to the Pacific. It took almost three years to prepare this expedition and a post was established at Fort George on the headwaters of what turned out to be the Fraser River and named the Fraser not by Simon himself, but by that other well-known explorer, Thompson. This location is known today on your car road map as Prince George. History states that Simon Fraser,late in May 1808, left Fort George heading the exploring group of 24, which included eight French Canadians. Despite all nature's treacherous hazards Simon Fraser and his courageous men navigated this river to the Pacific and returned safely to Fort George,thus competing one of the most daring expeditions of its kind. In later years Simon Fraser returned to the Fraser farm home near St. Andrews and here I must point out that Simon Fraser, a bachelor at 44, was different to most Scotchmen of that age; he married a Catherine Macdonell in St. Andrews R. C. Church. Four children, Margery, Harriet, Roderick (Rory) and James lived near St. Andrews following the burial of Simon Fraser and his wife on the same day in St. Andrews cemetery; one day separated their deaths. While visiting in Pasadena with Mrs. Gordon Robertson (nee Margaret Fraser, daughter of Rory, Second Kenyon) we hope to bridge the gap between the late Roderick (Rory) Fraser of St.Andrews and the late Roderick (Rory) Fraser, Second of Kenyon. Now let us turn to geography by driving alongside the Fraser River from the joining of the Thompson at Lytton, some 175 miles inland from Vancouver. Driving in Vancouver in a rented car was new to me, however, route signs were not difficult to follow as we took the 99-1 Kingsway. This was similar to getting on Decarie Blvd and 2B in Montreal., or Carling Avenue in Ottawa. The weather was favourable so we drove direct to Lytton via Trans-Canada-1. This is a small town, junction of Thompson and Fraser Rivers, and apparently an Indian settlement, as we note quite a number on the streets. Leaving Lytton, you wind up a hill from this town to the Trans Canada, like climbing a ramp in a car-park. We were heading south on the east side of the Fraser River and Canyon. The weather was ideal, crisp air, the sun struggling shaft-like through the mountain peaks and in some areas at road level, which I assume would be midway between river level and the peaks, there were some cloud banks. Right here the highway is excellent with several straight stretches. To your left there is an occasional home on gravelly soil that blends into what appears to be shale rock with a roof slant. A few Indians were cutting Christmas trees and these plump spruce or pine would roll down to the road shoulder like a barrel. However it was the right of the highway that we were interested to see. The Canyon here is wider and although it appears just as deep as the narrow stretch at Hell's Gate you pause to view, not in fear, the magnificent natural scenery from the murky waters of the Fraser upwards to the railway and higher to a sprinkle of snow coating the trees and on the snow-capped peaks. Don't ask me to define the colours but I do know they were varied. Just beyond Boston Bar there were road signs - "Slow"- Detour ahead. You are approaching huge equipment that blocks off the Trans-Canada; you can see the unfinished tunnel opening into solid rock and finally before you is the old original road, dirt surface, treading to the right with no guard rail or posts. Looking down into the Canyon it appears miles deep but you have to go on and as we crept by the side of the rock I wished I had nephew Alan Da Prato at the wheel. Traffic is permitted one way at 20-minute intervals. I certainly was delighted to see the pavement and flagman again. Finally we arrive at Hell' Gate. There is ample parking at this lookout and historical point. Here the river becomes a narrow gorge with swift flowing waters similar to the Niagara below the falls. The depth from the lookout, the height to the peaks and the narrowness create a giant chasm. Standing beside the historical plaque in memory of Simon Fraser's famous statement. "We had to pass where no human being should venture", with very little imagination you could picture the four canoes of the Fraser expedition entering this awful part of the Canyon so aptly named Hell's Gate and I am sure Simon Fraser made his above-noted remark just as soon as his canoe settled in calmer waters. Following the landslides in 1913-14, at this point even the salmon would not venture. Hence the building of the Fishways. We chatted briefly with two employees of the Fisheries Department and learned the fury of the river to the extent that the salmon, on their annual return to upper spawning waters, were battered back. Man-made concrete fishways, we were told, reduced the water velocity from approximately 25 feet per second to about 1 1/2 feet per second, thus enabling the fish to navigate as nature intended. Looking into this canyon you get an excellent view of both railways,tiny ribbons of steel and to my delight a C P freight wormed out of a short tunnel with four diesel engines. I counted the cars and there were 103, including the van. Imagine the changes since Simon Fraser's expedition. From canoes to mule trains of the Cariboo gold rush. The early trains with small locomotives and now on one side of the canyon, about 1,000 feet below, a one hundred-car train rolls smoothly and from the lookout this writer also rolled smoothly away in a 1960 car onto the Trans-Canada. We are able to do this because men like Simon Fraser DID pass where no human being should venture. There are many more points of interest along the Fraser, especially Jackass Mountain, named in memory of a mule which resented tugging of his halter shank, bucked a step backwards and, needless to add, the end of the road came suddenly as he dropped into the canyon. Yale is another point of interest as a guide arrow points to stone work by the English engineers building the road to the Cariboo gold fields. Now those Cape Breton disciples, Mrs. Blinn, Vince McIntyre and Dougald Dan, will ask, "How does this Fraser drive compare to our famed Cabot Trail?" The answer is in the setting, Both are thrilling with picturesque scenery changing every mile. However, as you enter the Cabot Trail from the North Shore you climb and wind to the "Top of Old Smokey". On your left the Atlantic breakers crash against the cliffs, while on your right you view tree-studded mountains and alleys. In the Fraser Canyon, on your left you are perched on the side of a range of the Rocky Mountains. You peer into the depth of the canyon and upwards to the peaks of mountains opposite, possibly higher than those the Trans-Canada clings to. So both scenic drives are in the top rating of Canada's numerous motoring routes. We have lost the sunshine due to rain; it's getting late, and we have taken up, more space than alotted so we will pick you up next week in Langley after visiting Dr. K. K. A. Macdonald and Mrs. MacLean.